Spaghetti alla carbonara (literally: charcoal burners’ spaghetti in Italian) is an Italian pasta dish based on eggs, pecorino romano, guanciale and black pepper. It was created in the middle of the 20th century. Cream is not common in Italian recipes, but is used in the United States, France, the United Kingdom, Australia and Russia (especially in Moscow). Italian Chef Luigi Carnacina used cream in his recipe Other Anglo/Franco variations on carbonara may include peas, broccoli or other vegetables added for colour. Yet another American version includes mushrooms. Many of these preparations have more sauce than the Italian versions. Dice the pancetta into small pieces (1 inch [2.5cm] will do). Bring a big pot of water to a boil and add salt when it begins to simmer. Cook the spaghetti until it is al dente and drain it, reserving ½ cup (118 ml) of water. As spaghetti is cooking, heat the olive oil in a large skillet over a medium-high heat. When the oil is hot, add the pancetta and cook for about 10 minutes over a low flame until the pancetta has rendered most of its fat but is still chewy and barely browned. In a bowl, slowly whisk about ½ cup of the pasta water into the egg yolks, using a fork. Add the Parmesan cheese and pepper. Mix with a fork. Transfer the spaghetti immediately to the skillet with the pancetta. Toss it and turn off the heat. Add the egg mixture to the skillet with the pasta and toss all the ingredients to coat the pasta. Taste the pasta and add salt and black pepper, if necessary. Alberini, Massimo; Giorgio Mistretta (1984). Guida all’Italia gastronomica. Touring Club Italiano. p. 286. Gossetti Della Salda, Anna (1965). Le ricette regionali italiane. Milan: Solares. Luigi Carnacina, Luigi Veronelli, La cucina rustica regionale (2. Italia Centrale), Rizzoli, 1977 republication of La Buona Vera Cucina Italiana, 1966. Vincenzo Buonassisi, Il Nuovo Codice della Pasta, Rizzoli, 1985. Herbst, Sharone Tyler; Ron Herbst (2007). “alla Carbonara”. The New Food Lover’s Companion, Fourth Edition. Barron’s Educational Series. ISBN 0-7641-3577-5. http://www.answers.com/topic/alla-carbonara. Labensky, Sarah R; Alan M. House (2003). On Cooking, Third Edition: Techniques from expert chefs. Pearson Education, Inc.. ISBN 0-1304-5241-6. Wright, Jeni (2006, 2007). Italy’s 500 Best-Ever Recipes. London: Hermes House, Anness Publishing. ISBN 0-681-46033-4. “Fettucine Carbonara”. Better Homes and Gardens. Yahoo!7 Food. 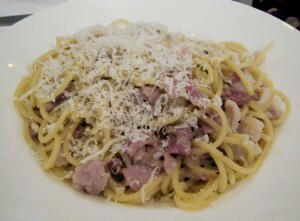 http://au.food.yahoo.com/recipes/recipe/-/5348809/fettucine-carbonara/. Carnacina, Luigi; Vincenzo Buonassisi (1975). Roma in Cucina. Milan: Giunti Martello. p. 91. Perry, Neil; Earl Carter, Sue Fairlie-Cuninghame (2006). The Food I Love: Beautiful, Simple Food to Cook at Home. Simon and Schuster. p. 114. ISBN 9780743292450. http://books.google.com/books?id=f9–loJsVdUC&pg=PA114. Mariani, Galina; Galina Mariani, Laura Tedeschi (2000). The Italian-American cookbook: a feast of food from a great American cooking tradition. Harvard Common. pp. 140-41. ISBN 9781558321663. http://books.google.com/books?id=Mz5tt-4yHIQC&pg=PA140. Davidson, Alan (1999). Oxford Companion to Food. Oxford: Oxford UP. p. 740. ISBN 0-19-211579-0.